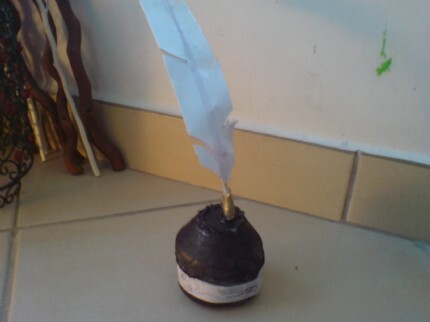 One can behold no more useful an accompaniment to the quill, than the magical ink pot. Waiting deep inside its velvet inky blackness, are all the words for all the tales that have yet to be told. Your task is to discover them and order them to your bidding. 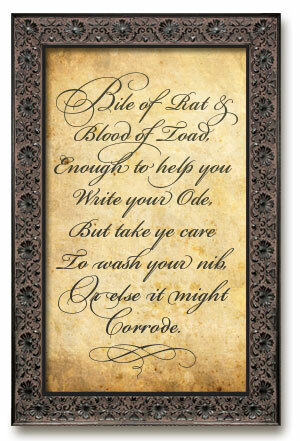 However, be sure to utter the Ink Pot Ode as an incantation, before you embark upon the creation of your great opus, and heed the commonsense therein.
. . . 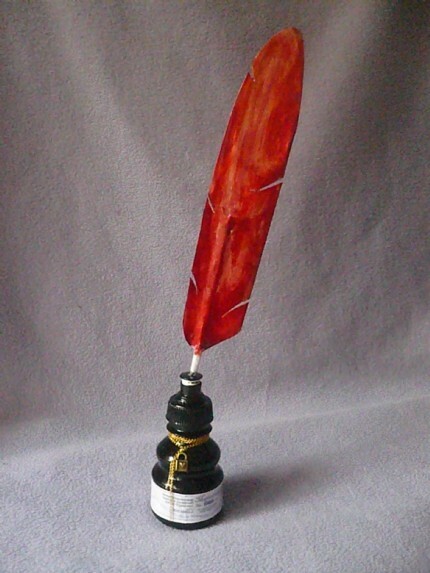 Your Magical Ink-pot which will be made using a few old kitchen cleaner bottle caps or a single serving drinks bottle, will look utterly fabulous, and besides, it’s a great way to keep your feather quill on your desk. 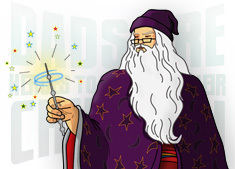 No serious wizard or witch would think about starting their new term without it.
. . . 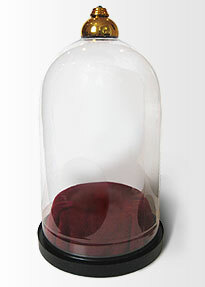 There is more than one way to make our ink pot and it all depends on what junk you have at hand to make it with. 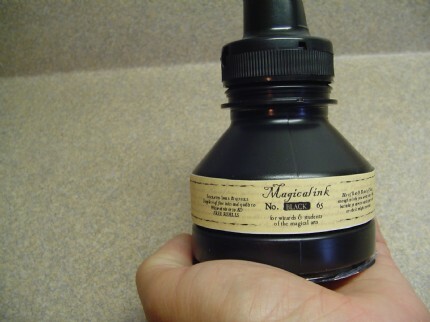 Any small juice bottle (single serving) or small shampoo or conditioner bottle may be cut down to size, sprayed black and simply made in to the finest looking Magical Ink-pot. 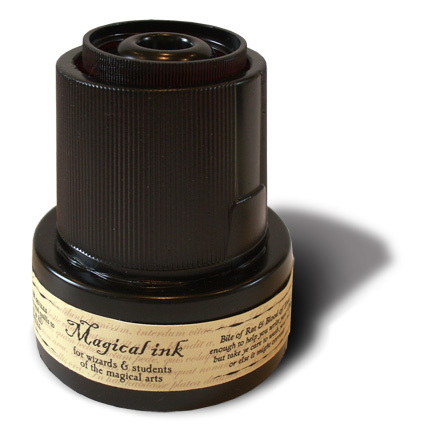 Because the finishing touch of any magical ink-pot is the label, you'll find that we have provided three different sizes of label on the label download. The label also cleverly covers up the join in the bottles that you have cut down to size. To make sure that it goes round properly, stick it on at the front first, and then wrap both ends round to the back, trimming to the correct length at the back for a really neat finish.
. . . Download, the graphic printable bottle labels and whichever instructions best fit your needs, and get making magic. 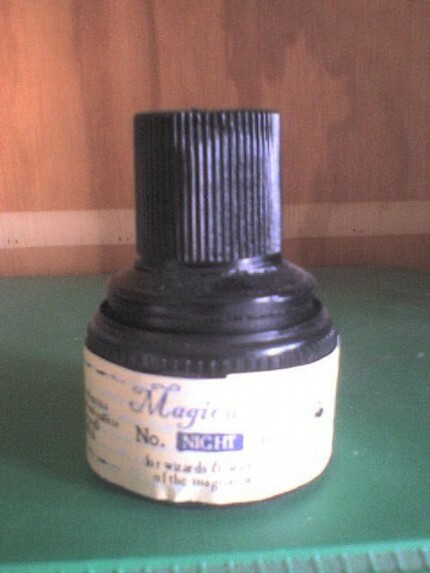 One set of instructions will show you how to make the ink-pot from three old packaging lids, the other, how to make the ink-pot from a small, single serving bottle. Make a different one with each of your children (if you magically have more than one), or for each colour of ink. The instructions and all the graphic printable templates are available in both A4 and US Letter size downloads just click on the size you need to download it. 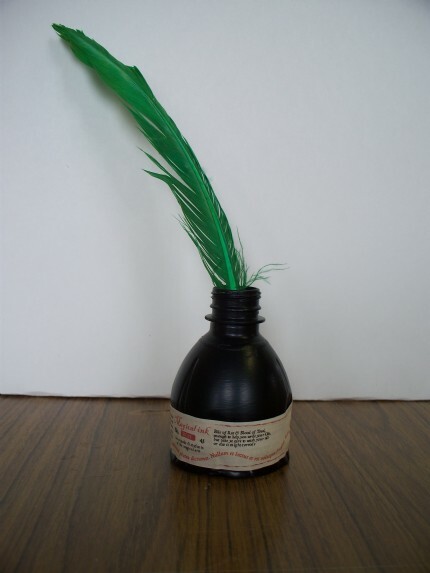 Choose these instructions if you have collected some packaging lids that you can use to make your ink-pot. 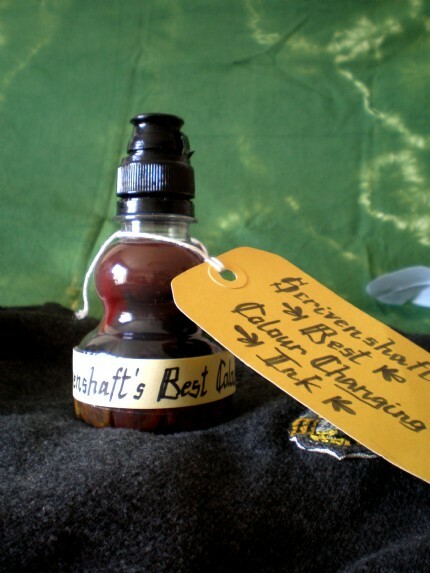 Choose these instructions if you have a small bottle that you can use to make your ink-pot. 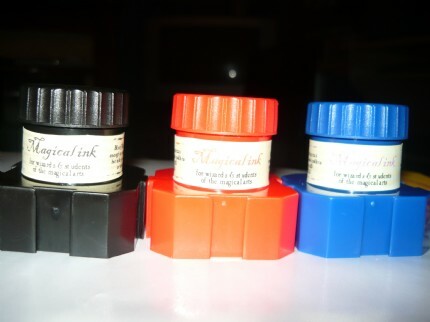 Download and print off these labels to add the finishing touch to your Magical Ink-pot. 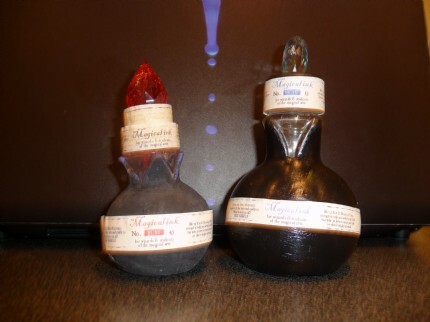 Posted by tuskel - Since I made two quills, red and blue, I thought it would be fun to make the colour changing ink that is mentioned in Philosopher's Stone. 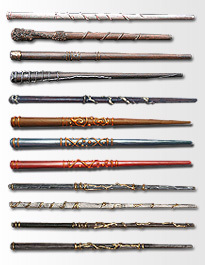 Harry buys some in Diagon Alley. However, the name of the wizarding stationery shop is never mentioned. There is one in Hogsmeade, called Scrivenshaft's though (as mentioned in Prisoner of Azkaban) and I figured they must sell some, too. This bottle is made of a water bottle - surely recognisable - and painted inside with different acrylic paints - red, blue and ochre mixed with black. After it was almost dry (we just couldn't wait! ), I taped it up and added the labels. Posted by puffleprincess - I made these for my youngest son and I have really enjoyed making them thank you for your site. 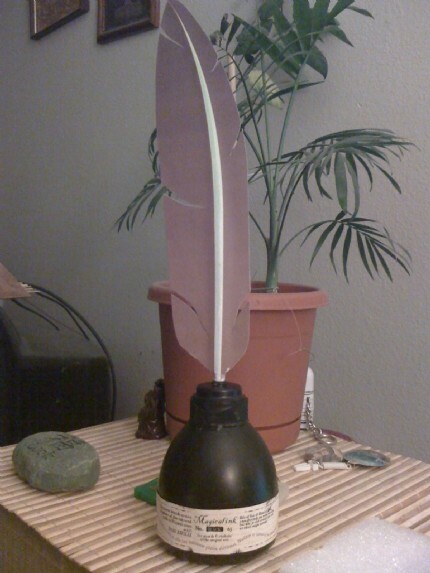 Posted by yoyomax12 - This was made using a powerade (Gatorade) bottle. Posted by bjohnson - Thanks for making this project so easy and fun! Posted by macca - This was surprising easy to do and so impressive. I'd recommend anyone to try it out! Posted by sausages - I used these really funky smoothie bottles and painted them black. I stuck the fabby labels from dadcando on and shoved a pretty gem stone cork in the top!!! 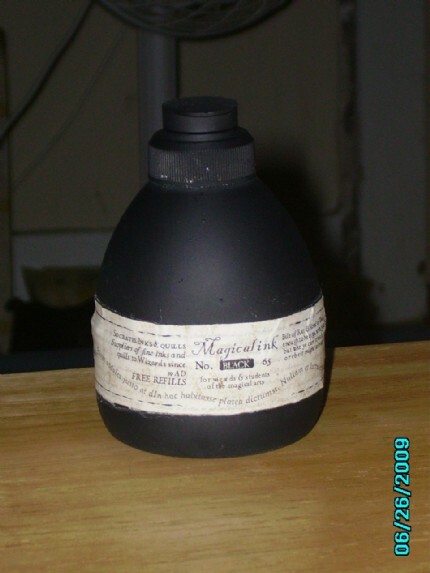 Posted by harrypotter123 - The label on this ink pot is from this website. I am telling this because the label cannot be seen. I used the second instructions of it.